lures, manually operated spears, spear guns, and crossbows . Is this the sort of "sport" you want to witness when you're peacefully hiking or boating through the park? Allowing sport hunting of alligators not only robs the alligators of peaceful sanctuary, it robs the hundreds of thousands of us who are "non-consumptive users" of this natural haven too. I regularly drive 45 minutes to visit Loxahatchee NWR and take solitary walks along the levies. I take my children to the festivities for Everglades Day. The pristine natural beauty of the preserve, the opportunity to observe our native fauna in their natural habitat, the very peace of the place is under threat from this proposal, just as the alligators are. 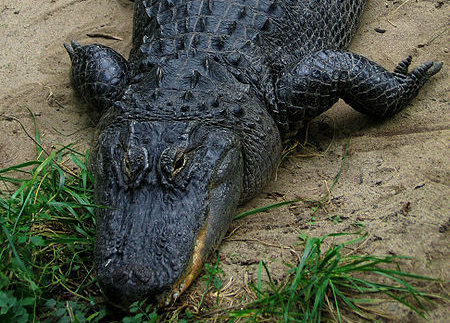 I say NO to the cruelty of alligator sport hunting at Loxahatchee. I say NO to diminishing an animal population that is already under pressure from loss of habitat and invasive species. I say NO to a violation of the very idea of a refuge. I say NO to the violence threatening to intrude on a place of peace. Please let your voice be heard on this important matter today!